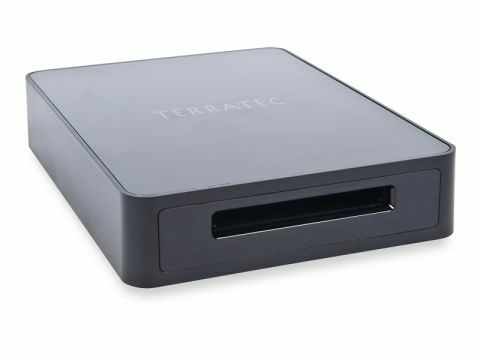 Encased in a smart black box, the Terratec S7 DVB-S/S2 tuner plugs into a spare USB 2.0 port on your computer, including laptops, although a mains outlet is needed for the accompanying power supply. The only other connectors are a dish/LNB input and, unusually, a CI slot for pay-TV services (excluding Sky). Naturally, the S7 is compatible with free-to-air satellite broadcasts, including Freesat ones, although you don't get Freesat's EPG. Thanks to its DVB-S2 compatibility, you can catch free hi-def services including ITV HD and BBC HD. A powerful PC is essential for glitch-free viewing, though. Another boon is that TV and radio channels alike can be recorded to your PC's hard disc; timeshifting is also possible. Terratec's accompanying 'Home Cinema' software looks after this, but the BDA (Broadcast Driver Architecture) hardware-drivers can work with third-party software like DVBViewer and DVBDream. Built into the S7 is an infrared sensor that takes commands from the supplied 37-button handset. A 'remote-control editor' will configure the handset for other applications. Software comprises the Windows only 'Home Cinema' and a 'lite' version of Elgato's EyeTV for Mac users. Home Cinema turns your PC into a basic single-tuner satellite PVR. In addition to a resizeable (up to full-screen) video window is the control panel, which lists EPG derived programme data and other information. Buttons sequence through channels, take 'snapshots', change aspect ratio, access the timer and engage teletext, radio mode or the EPG. The latter supports timer programming and now-and-next or, if available, seven-day schedules. Home Cinema dovetails with the tvtv online EPG, and indeed a free trial subscription is included. Recording can also be manually invoked; there may only be one tuner but you can simultaneously watch and record different channels if they're on the same transponder. Clicking OK brings up a complete channel list – an alternative is to choose one of the four user definable favourites lists. Other features include picture-in-picture, subtitles and support for Dolby Digital audio. Home Cinema is easy enough to set up – select the satellite you're after, specify its DiSEqC position (a maximum of four – only version 1.0 of the standard is catered for) and start scanning. FTA/scrambled-only or all-channel scans are supported, but options like blind search are unavailable. Other setup menus look after functions like channel management, AV matters and recording mode ('transport' – i.e. TS – or the more compatible 'program' streams – e.g. .mpg). Performance-wise, the S7/Home Cinema combo couldn't really be faulted. All available channels were found, although searching is ponderously slow. Picture and sound quality are limited only by transmission quality and the capabilities of your computer. Over a couple of weeks the system didn't crash once. It's also efficient in terms of system resources – when displaying TV it accounted for 10 per cent of an Intel 2.8GHz P4 with 2GB of RAM.